L. Rana vulgarius, Eng. frog. In Spain frogs were eaten when fish were scarce. Villena describes the frog as a medicinal reptile that refreshes the liver. An English prescription of Thomas Fayreford, an English practitioner, from the first half of 15th century states: take a green frog that leaps in the trees as it will anoint any tooth that you wish to fall out (ordinary pond frogs are not so good for the purpose). Frog references have had derogatory connotations throughout history. During the Middle Ages in particular the English called Parisians ‘froggies’, for their love for frogs’ legs and their rivalries. When something goes badly in Spain "it turns into a frog," not the other way around as happened to the prince as happens in the Grimm brother’s German fairy tale. Frogs are born tadpoles and live in water the first part of their lives until they develop into amphibian frogs. Frogs’ eyes are on the top of their heads so that they can see all around. Their tongues ae attached to the front of their mouths making it easier to catch bugs to eat. Frogs can jumo across a football field in four leaps. There are more than 4,000 different kinds of frogs in the world. Not only are there green frogs but transparent, red, blue, orange and yellow ones. Some are poisonous. Most frogs have eyes on top of their heads, so they can see all around to watch for predators. If you could hop like a frog, you would be able to cross a football field in just four jumps. A frog’s tongue is attached to the front of its mouth, not the back, so it can reach farther for yummy bugs. 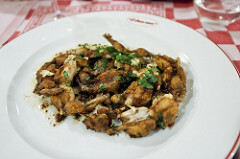 No medieval Spanish recipes for frogs seem to have survived but the French are famous for skinning and breading frogs' legs with flour, chopped garlic and parsley and frying them in butter after soaking them in milk. They are served with a butter, garlic and parsley sauce.